1. What imaging do you use for patients with possible acute, traumatic spinal cord injury? Patients who can be cleared using the Nexus or Canadian C-spine criteria should be cleared clinically. 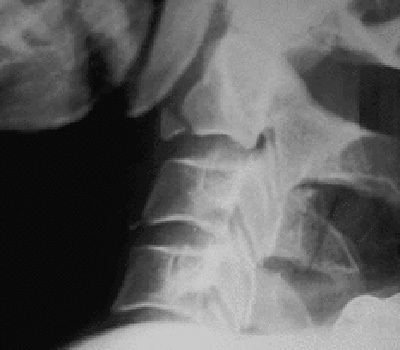 However, those with moderate to high risk of a cervical spine (C-spine) injury should have cross sectional imaging, based on substantial amounts of data. The Eastern Association for the Surgery of Trauma (EAST) referenced 52 articles to construct guidelines recommending against plain radiographs in the assessment of potential C-spine injuries (Como, 2009). Although the C-spine is actually only injured in approximately 3% of all major trauma patients, (Crim, 2001) these tend to be some of the most disabling injuries. There is less data regarding the type of imaging preferred for patients with possible thoracic and lumbar spine injuries. In patients in whom you cannot clear their C-spine clinically and you suspect an acute, traumatic spinal cord injury, computerized tomography (CT) scanning is the most appropriate initial imaging. There is a growing body of literature stating that plain films miss many clinically significant injuries, and have little to no role in evaluating spinal fractures, particularly those of the C-spine. The argument against this is that some patients may actually be appropriate for plain film imaging of the C-spine. These are patients who are deemed low risk mechanism, younger, and in whom good views can be obtained. There will still be some fractures that are missed, but these have a low chance of being clinically significant, and in a patient with low pre-test probability, this may be appropriate utilization of plain film imaging. The most compelling argument for this comes from the original NEXUS study. Of 34,069 patients with blunt trauma, 1,496 had C-spine injuries. Plain films missed 564 injuries in 320 patients. However, for 436 of these injuries, 0.80% of all patients, the plain films were interpreted as abnormal (although non diagnostic) or abnormal. Only 23 (0.07%) of all patients in the studies had injuries that were not seen on plain films that were also read as negative. Three of these patients had unstable c-spine injuries (Mower, 2001). In a retrospective review of a trauma database of 3,018 patients, 116 (9.5%) had a C-spine fracture. The injury was only seen in 75 of these patients on plain film. In the remaining 41 patients (3.2%), the injury was detected on CT scan, and in all cases these injuries required treatment. It is important to recognize that the mean Glasgow coma score (GCS) of this patient population was 13, thus, they were likely a high acuity patient population overall. These authors concluded that there was no role for plain imaging in patients in whom a C-spine injury is suspected in the Emergency Department population (Griffen, 2003). Most recently, Mathen, et al. performed a prospective cohort study of 667 patients who required C-spine imaging. They found that plain radiography missed 15 of 27 (55.5%) clinically significant c-spine injuries (Mathen, 2007). In a cost effectiveness analysis, CT was found to be the preferred modality for imaging in moderate to high risk patients, given that missed C spine fractures and resultant paralysis may be devastating to both the patient and society (Blackmore, 1999). Unlike C-spine fractures, we have no clinical decision rules to help guide our care of patients with potential thoracolumbar fractures. There is considerably less data on thoracolumbar injuries. According to a literature review published in the Journal of the American College of Radiology, which looked at studies on TL spine imaging comprising several thousand patients, those who should be evaluated for thoracic or lumbar spine injuries are those with high force mechanism and any of the following findings: back pain or midline tenderness, local signs of thoracolumbar injury, abnormal neurologic signs, C-spine fracture, GCS < 15, major distracting injury, or drug or alcohol intoxication (Daffner, 2007). There is evidence to suggest that many injuries may be missed by plain films of the thoracolumbar regions. One study of seventy intubated trauma patients found that thin slice CT discovered 100% of unstable fractures in comparison with 56-80% (depending on spinal level) seen by conventional radiographs (Herzog, 2004). A prospective evaluation of 1.915 trauma patients presenting to a Level I trauma center compared the sensitivity of CT versus plain film in the detection of the 78 thoracic or lumbar spine fractures sustained by the group. CT sensitivity was 97% and 95% for thoracic and lumbar injuries, respectively. For plain films those numbers were 62% and 82% (Sheridan, 2003). Yet another study in high acuity trauma patients found the sensitivity of CT to be 97% and that for plain films to be an abysmal 33.3% (Wintermark, 2003). In a retrospective review of 3,537 patients, the only fractures missed by CT scan were a cervical compression fracture identified on MRI, and a thoracic compression fracture identified by plain films. This study recommended that plain films of the spine are unnecessary in the evaluation of blunt trauma patients. Furthermore, after a panel reviewed all literature on the topic, the American College of Radiology Appropriateness Criteria recommended that patients with potential thoracic or lumbar spine injury undergo CT scan, as opposed to plain films (Daffner, 2007). The ACR grades on a scale of 1-9, with 1-3 being usually not appropriate, 4-6 may be appropriate, and 7-9 usually appropriate. Their level of recommendation in this indication is a 9. Due to the data regarding imaging, most patients should undergo CT imaging for possible spinal trauma. Only the lowest risk patients who have adequate plain films should be cleared without CT imaging. 2. How do you treat neurogenic shock? Neurogenic shock is a form of distributive shock unique to patients with spinal cord injuries. Fewer than 20% of patients with a cervical cord injury have the classic diagnosis of neurogenic shock upon arrival to the emergency department, and it is a relatively uncommon form of shock overall (Guly, 2008). Patients with injuries at T4 or higher are most likely to be affected by neurogenic shock (Wing, 2008). It is caused by the loss of sympathetic tone to the nervous system, ultimately leading to an unopposed vagal tone (Stein, 2012). Many times the terms “spinal shock” and “neurogenic shock” are used interchangeably, although they are two separate entities. Spinal shock consists of the loss of sensation and motor function immediately following a spinal cord injury (Nacimiento, 1999). During this period of spinal shock, reflexes are depressed or absent distal to the site of the injury. Spinal shock may last for several hours to several weeks post injury (Nacimiento, 1999). Symptoms of neurogenic shock consist of bradycardia and hypotension (Grigorean, 2009). Bradycardia is typically not present in other forms of shock, and may provide a clue to clinicians that a patient has sustained a spinal cord injury. However, emergency physicians should recognize that hemorrhagic shock needs to be first ruled out, even in patients with bradycardia, many patients with hemorrhagic shock are not tachycardic (Stein, 2012). Cardiac dysfunction is another feature of neurogenic shock, and patients may present with dysrhythmias following injury to the spinal cord (Grigorean, 2009). The American Spinal Injury Association (ASIA) has classified injuries based on motor and sensory findings at the time of injury. ASIA A and B injuries are the worst; with A being a complete motor and sensory loss with no preserved function in the sacral segments S4-S5. ASIA B includes patients who have sacral sparing, meaning that they have function of S4 and S5 (Marino, 2003). Neurogenic shock is rarely encountered in the emergency department, however, it is important to recognize that almost 100% of patients who sustain complete motor cervical ASIA A or ASIA B injuries develop bradycardia. Thirty five percent of these patients ultimately require vasopressors, so management of neurogenic shock is imperative for emergency physicians (McKinley, 2006). There is no conclusive data regarding the optimal time to start vasopressors, however, it is important to maintain appropriate hemodynamic goals in patients with spinal cord injuries. Hemodynamic goals in patients with spinal cord injuries are unique. A systolic blood pressure <90 mmHg must be corrected immediately (Muzevich, 2009). The American Association of Neurological Surgeons and the Congress of Neurological Surgeons Guidelines for the Acute Management of Spinal Cord Injuries both recommend a MAP at 85 to 90 mm Hg for the first seven days following a spinal cord injury based on observational descriptions of the hemodynamics in spinal cord injured patients (Levi, 1993; Licina, 2005). Patients who are suspected of being in neurogenic shock should receive adequate fluid resuscitation prior to initiating vasopressors (Wing, 2008). However, there are no current recommendations regarding the first line vasopressor for neurogenic shock (Stein, 2012). Depending on a patient’s hemodynamics, this vasopressor will likely be norepinephrine, phenylephrine, or dopamine. Norepinephrine is an excellent first line vasopressor in neurogenic shock due to its alpha and some beta activity, thus leading to its ability to improve blood pressure and heart rate (Stein, 2012). Phenylephrine is another common choice because it is easy to titrate and can be given through a peripheral line. A disadvantage of phenylephrine is the fact that it can lead to reflex bradycardia due to its lack of beta agonism. This drug may be most appropriate in patients who are not bradycardic (Wing, 2008). Dopamine is another option, however, it may lead to diuresis and ultimately worsened hypovolemia (Stein, 2012). It does have beta agonism, and in bradycardic patients may be favored over phenylephrine (Muzevich, 2009). Dopamine is unlikely to be tolerated in patients who are experiencing dysrhythmias. 3. What is your management and disposition for elderly patients with vertebral compression fractures? Vertebral compression fractures of the thoracic and lumbar vertebrae are extremely common in the elderly population, with an annual incidence of 1.5 million vertebral compression fractures per year (Barr, 2000). They are most commonly seen in patients with osteoporosis, although may be seen in younger patients, particularly those with malignancy. The majority of patients are treated non-surgically, usually with bed rest and hyperextension bracing (Gardner, 2006). Pain is typically the presenting symptom, and neurologic deficits are rare unless there is retropulsion of bone into the vertebral canal. This presentation is rare in compression fractures, but it does constitute a surgical emergency (Kavanagh, 2013). Although some patients may experience mild or minor symptoms related to a vertebral compression fractures, many patients will have a significant degree of pain and decreased quality of life associated with their fracture (Adachi, 2002). At a minimum, patients with very mild symptoms and a normal neurologic exam may be discharged home with adequate pain control and spine surgery follow up established. Therapy should be tailored toward avoiding a prolonged period of bed rest as well as adequate pain control (Wong, 2013). Prolonged immobilization may lead to poor pulmonary toilet, venous thromboembolism, and deconditioning, especially in elderly patients. Non-steroidal anti-inflammatory drugs (NSAIDS) are first line therapy since they are non-sedating, but may be poorly tolerated in certain groups of patients such as the elderly or those with underlying peptic ulcer disease (Wong, 2013). Opiates and muscle relaxers may be necessary for pain control, but should be used with caution in the geriatric population, especially those at risk of falls. Although admission of elderly patients with vertebral compression fractures may not result in surgical management, it may provide other avenues of therapy that are unavailable or difficult to arrange in the ED setting. One of these therapies includes physical therapy, which may help patients regain early mobility if introduced appropriately. Physical therapy is also helpful in training patients to strengthen other extra-axial muscles, particularly the spine extensors (Wong, 2013). Several trials have demonstrated effectiveness of physical therapy in patients with vertebral compression fractures. Malmros et al evaluated a 10-week physical therapy program in a placebo-controlled, randomized, single-blinded study that demonstrated improved quality of life and reduction in pain and analgesic use (Malmros, 1998). Papioannou, et al. conducted a randomized controlled trial consisting of a 6 month home exercise program and found that patients in the physical therapy arm had significant improvement of quality of life scores and improved balance at one year (Papaioannou, 2003). The decision of when to use thoracolumbosacral orthosis (TLSO) brace in a patient with a vertebral compression fracture is somewhat controversial. Pfeifer, et al. demonstrated in a randomized trial that the use of a brace increased trunk muscle strength and was associated with an improved quality of life, decreased pain, and improved daily functioning in patients with compression fractures (Pfeifer, 2004). However, an electromyelography study demonstrated increased muscle spasming in patients with brace placement (Lantz, 1986). Furthermore, braces may contribute to skin breakdown, especially in geriatric patients. If a TLSO brace is given to patients, it should be done in consultation with a spine surgeon. Surgical management options for vertebral compression fractures include kyphoplasty and vertebroplasty. Both procedures are minimally invasive, but are traditionally only performed if patients are in pain several weeks following diagnosis of a compression fracture (Wong, 2013). Patients who are discharged from the ED with compression fractures need to be able to ambulate and perform activities of daily living prior to discharge. If pain control limits these activities, they will likely require admission for pain control, physical therapy, and potentially rehabilitation. 4. How do you clear a C-spine after a negative CT in a trauma patient who is awake, neuro intact, wearing a collar? According to EAST guidelines, there are multiple appropriate options in patients who are awake, neurologically intact, and still have midline tenderness after a negative CT (Como, 2009). Although CT scans will pick up the majority of injuries, it is well documented that they specifically may miss ligamentous injuries, subluxations, and dislocations (Woodring, 1992). The first option is to obtain an MRI within 72 hours post injury. Very little data exists in the literature regarding this option. Schuster, et al. evaluated prospectively collected registry data for 2854 blunt trauma patients, 93 of whom had a normal neurologic exam at admission, a negative CT result, and persistent C-spine pain. These patients all had an MRI. In all 93 of these patients, the MRI was negative for clinically significant injury. However, the argument could also be made that since no clinically significant injury was detected by MRI in this case, that there was no need for any further imaging (Schuster, 2005). The second option is to continue the C-spine immobilization until there is no midline tenderness and the patient has been followed up as an outpatient. This is not ideal in centers where there is no trauma team to assist in outpatient management of these patients. Furthermore, the collar itself poses a risk of skin breakdown and decubitus ulcers when worn for a prolonged period of time. This option may work best for patients who can rapidly be seen in a trauma clinic. The third option is to obtain flexion-extension films in patients with a negative CT of the C-spine. Although studies have evaluated the utility of flexion-extension films in patients with negative plain films of the C spine, no study has completely evaluated flexion-extension films following a negative CT of the C-spine. Insko et al reviewed 106 patients with negative plain films or negative CT imaging in areas that were not visualized by plain films. This study demonstrated a false negative rate of zero in diagnosing C spine fractures when flexion extension films were performed in patients who were persistently tender (Insko, 2002). Ultimately, more information is needed to determine the best course of action to take in a patient with persistent pain following negative CT imaging of the C-spine (Como, 2009). However, at this time, there are three potential options in ruling out a C-spine injury in these patients. The decision may largely depend on local practice patterns, clinical suspicion for injury, as well as a patient’s ability to follow up. This entry was posted in Uncategorized and tagged canadian, collar, compression, neurogenic shock, nexus, spinal cord injury, vertebral. Bookmark the permalink. Awesome review as always. Please keep this up. Questions are always relevant. Thanks Swamy (sp?) and whoever else helped you with this if any. I work in a rural community setting and have worked in different ERs and one thing I have noticed for sure is that there is no standardization as to which c-collar immobilization is best. I’ve been told Miami J and Philadelphia collars are ok but I don’t think there is any good data in this. I’m pretty sure a soft cervical collar is not optimal but again I do not have good data this. One thing for sure is the EMS plastic collars are suboptimal as there is little if any protection for skin breakdown. Any thoughts on this? This is a great review (as usual). I figured I would point out the below articles, because I do take some issue with your advice on c-spine clearance with a negative CT.
you can imagine, getting them off the vent is not easy – I won’t even mention their general discomfort or what they can do to ICP in a TBI. If we’re going to subject a patient to something like this, we better be damn sure it’s necessary. Regarding Question #3: vertebral compression fractures – I would like to mention that calcitonin is an option is these patients. NSAIDs are often problematic in the elderly as well as opiates. A fair amount of data seems to support calcitonin and I often prescribe this to my elderly patients with acute vertebral compression fractures. Some of the reports below may be biased by pharm interests, but it is a low side effect option. I would be interested if anyone else uses this and any feedback. Thank you. Silverman SL. Calcitonin. Endocrinol Metab Clin North Am 2003; 32: 273-84. Lyritis GP, Ioannidis GV, Karachalios T, et al. Analgesic effect of salmon calcitonin suppositories in patients with acute pain due to recent osteoporotic vertebral crush fractures: a prospective double-blind, randomized, placebo-controlled clinical study. Clin J Pain 1999; 15: 284-9. Lyritis GP, Trovas G. Analgesic effects of calcitonin. Bone 2002; 30(5 Suppl.1): 71-4. Blau LA, Hoehns JD. Analgesic efficacy of calcitonin for vertebral fracture pain. The Annals of Pharmacotherapy 2003; 37: 564-70. Silverman SL, Azria M. The analgesic role of calcitonin following osteoporotic fracture. Osteoporosis Int 2002; 13: 858-867.